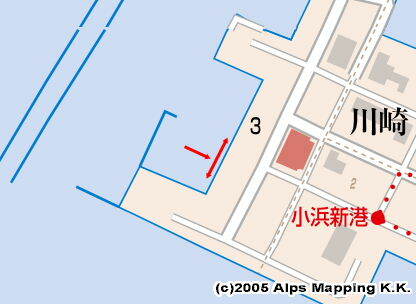 When you approach Obama Port, you will take a route close to a promontory running from the east in front of the port. While the route has enough depth, there are about 20 square rafts for anglers are deployed from the promontory. If you take the original planned route, i.e. the red line on my Google map, you hit these rafts. Then, you need to change the route to the right, i.e. west. Once you come close to the rafts, you will have a clear view of them. It is easy to find out the white lighthouse at 35 30.050N 135 43.940E. Passing by the white lighthouse on your left and the red lighthouse on your right, move into the port. You move further behind the red lighthouse and moor at the east quay. When I reached there, the east quay was always open. Then you can moor alongside there. The back area was calmer. 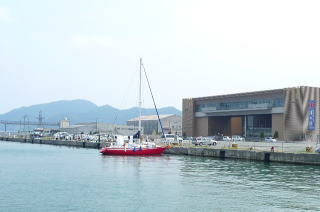 The north quay in the back had a sightseeing ship loading passengers. I also saw another berth place near Coast Guard though, big ships for anglers were coming in and going out. I didn’t see any open berth space for sailing boats. A public bathhouse is one minute walk away. A clean toilet in Shoku Bunka Kan building opens from 9:30. Another small toilet is 3 minutes walk away in the north. Water is available at toilets. Provisions: A shopping center and A-COOP are 20 minutes walk away. A coin laundry is next to the shopping center.